English clubs are "narrowing the gap" on Europe's elite in the Champions League, says ex-Manchester United defender Phil Neville. All five Premier League teams are unbeaten and sit top of their groups after three games played. "It's not too early to say the tide is changing. The performances alone are saying that," Neville said on BBC Radio 5 live. "We could get two or three clubs into the quarters or semi-finals." Where do English teams sit? Having provided just four Champions League quarter-finalists in the past five seasons, England's five clubs are now in pole position to qualify for the last 16 this campaign. Spain have dominated the competition since 2013-14, with Real Madrid winning it three times and Barcelona once, in 2014-15. Spain have also had three teams in the last eight in each of the past five seasons. On Wednesday night, Manchester United beat Benfica 1-0, while Chelsea drew 3-3 in a thriller with Roma at Stamford Bridge. Tottenham secured an impressive 1-1 draw at Real Madrid on Tuesday, while Liverpool thumped Maribor 7-0 and Manchester City beat Napoli 2-1 on the same night. "We've been nowhere near Barca or Real in the last few seasons. Particularly with Tottenham last night it looks like the gap is closing," added Neville. "It's a very good start. I don't think we're going overboard. If we were scraping through games I'd say 'yes' [we're going overboard]. But we're showing strength and quality. "It's long overdue. With the strength we've got in the competition we have to be looking to get at least two teams into the semis. "It's been quality in the final third, the football and the finishing. We've raised the bar. "I think the fear factor is coming back. We're taking control of games and I think the whole of Europe are starting to think English teams are powerful again." How much have English clubs improved? 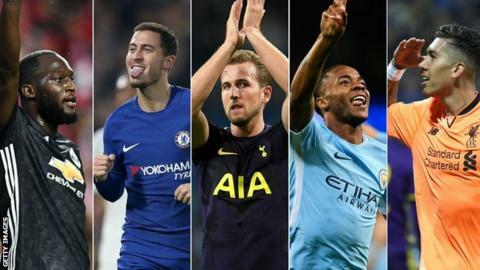 It is the first time since 2008-09 that English clubs have gone undefeated after the first three games of the Champions League group stage - Arsenal, Manchester United and Chelsea would reach the semi-finals that year, with United losing to Barcelona in the final. The past five years have been particularly barren for Premier League sides. English teams made the quarter-finals five times in that period, while Spanish sides reached the same stage on 15 occasions, German teams nine times and French sides six. But the early signs are good for the Premier League outfits this season, with a collective win percentage of 73% so far in the group stage. Spain's four clubs meanwhile have a 50% win record, the same as France's two teams. And England's five teams have averaged 7.4 points between them in the group stage so far, better than any of the previous five campaigns after the first three games.